Chinese pilot taikonaut, 1996-on.Trained together with Wu Jie in Russia in for one year beginning in November 1996. They formed the basis of the Chinese astronaut cadre for the Shenzhou program. Status: Active 1996-on. Born: August 1962. Birth Place: Dingyuan, Anhui. One of the two first reported Chinese astronauts. Trained together with Wu Jie in Russia in for one year beginning in November 1996. They formed the basis of the Chinese astronaut cadre set to fly on the Shenzhou indigenous spacecraft after the year 2000. Li was 170 cm tall and weighed 67 kg. He graduated from the PLAAF Missile College in 1987 and later the PLAAF Flight College. As a PLAAF pilot, he accumulated 1230 flight-hours. 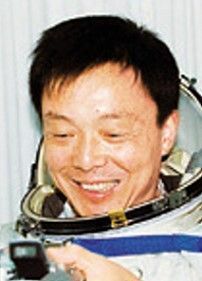 In January 2003 Hong Kong newspapers identified 'Chen Long' as the pilot for the first manned flight of Shenzhou, planned for October 2003. Some Western observers considered 'Chen Long' to be a corruption of 'Qinglong' and this was confirmed by the Hong Kong paper days before the scheduled launch. In the 05/2003 issue of Fliegerrevue, Li Qinglong was one of 14 names listed as Chinese astronauts in training. However the honor of being the first Chinese citizen in space went to Yang Liwei. Family: Taikonaut. Country: China. Agency: PLAAF. Bibliography: 5690.